In 1965 my parents arrived in Australia from Italy. Three years after their arrival in 1968, when my Dad was eight years old and watched the first moon landing a year later with no doubt astonished eyes, the Glenrothes distillery in Scotland distilled and placed in oak casks the whisky I am about to taste. This whisky then sat in Speyside for 35 years in an oak cask, waiting patiently to be tasted. As I fill my glass with this golden liquid in the Melbourne air, my King Charles Cavalier stares with a tilting head and wonders what all the fuss and ceremony is about! This whisky took 35 years to produce but only 20 minutes to fully savour and enjoy in a small glass. That is what I love about old whisky, the experience! Thinking about the time it was distilled and the fact that the contents in my glass took several decades to produce. Now, how does it taste? Soft and delicate with a silky smooth aroma that caresses the senses, this whisky offers subtle hints of honey and the fragrance of oak. A feature of the nose of this whisky is that it does not overpower the olfactory senses with the strike of alcohol but instead softly releases its smell. 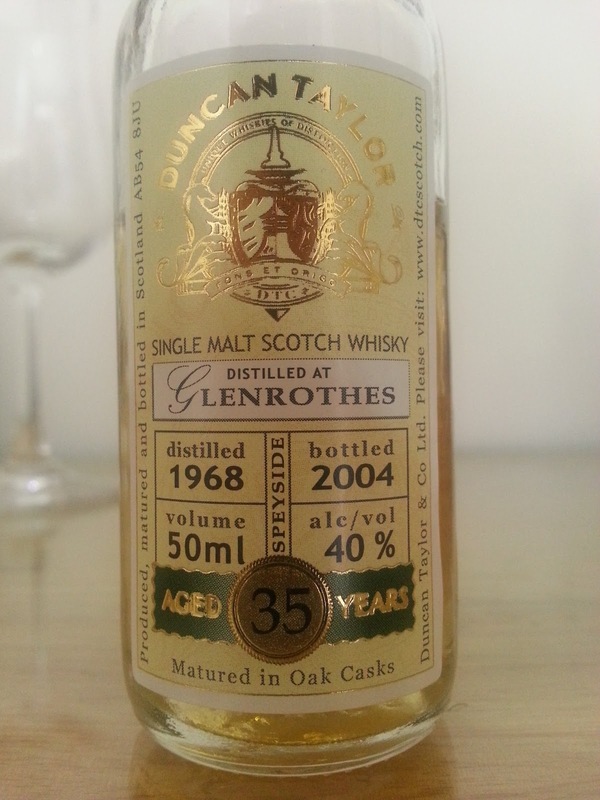 Some young spark in this old whisky, some pear and walnuts are drizzled with dark chocolate and sapped oak. This whisky strikes the palate with a clean and crisp sensation, with strong citrus and oak embracing the tongue over so softly. Having sat in oak for 35 years the taste of wood hits the tongue. This is quite possibly the most drinkable whisky I had the pleasure of tasting because it is so soft and textured, almost with a lovely oily velvetiness that functions to not only provide flavor but tease the tongue and prepare it for the next sip. The taste of this whisky builds up upon hitting the tongue and remains, and the taste of age lingers. No alcoholic burn is noticed at all which is unlike any whisky I have tasted (possibly due to the age of this whisky). Each sip is separated by quite some time as the taste of lovely oak radiates from the tongue. On my final sip it has lasted about 5 minutes, and like Pavlov’s dogs (and my little cavalier at dinner time) I salivate for some more! The age of this whisky and its distinct oak dominated taste may not appeal to all people, but I have found it thoroughly enjoyable. It is subdued but at the same time powerful enough to evoke strong flavor and a solid finish. At least now I can say I have tasted a whisky older than I am! It is lovely in its own special way, but age has noticeably quelled some of its fire! It also seems to lack some complexity. This is not necessarily a negative feature of this whisky, just a different feature of this whisky. I am very lucky to have had the opportunity to try a 35 year old single malt scotch whisky. Apart from its oak dominated taste, there is lots oregano and basil intertwined with bitter cherry and some citrus notes (lemon juice and flesh, rind). This whisky is excellent in its own special way. Despite its age this dragon has retained some fire in its belly, although much of it has been softened with time (three and a half decades to be exact). This whisky has the heart of a pup, but is held down by a bad back and a toothless bite... though its jaws have considerably clamping power! This entry was posted in Speyside. Bookmark the permalink.